Although we are clearly in the cars-not-students-on-bikes camp w.r.t the Abbey Wood and UWE bike paths, we are worried that those people trying to exercise their legal right to drive along the abbey wood path are entering dangerous ground. You see this cyclist who is walking on the UWE path while holding a phone up to their ear? If they were a student then yes, sounding your horn as you clipped them with your wing mirror on a bike path to which you had inherited ancient access rights would be the right thing to do. But he's not in student clothes is he? He's in full army uniform with cap and camouflaged rucksack, and that probably means he's spending a few months at abbey wood in between some posting in Iraq or Afghanistan -places where any perceived threat to the foot patrols is met by a fairly aggressive response. Cut someone like this up in your car and he's going to use that phone to call in air support to deal with your mondeo, and as we are only 10 seconds flight from BAe Filton, a dispersal site for the UK airborne nuclear weapons fleet in the cuban missile crisis, that response could be pretty destructive. We urge whoever it is who claims historical right to drive down the Abbey Wood bike lanes to show some sanity here, to show some restraint. The alternative is worse. 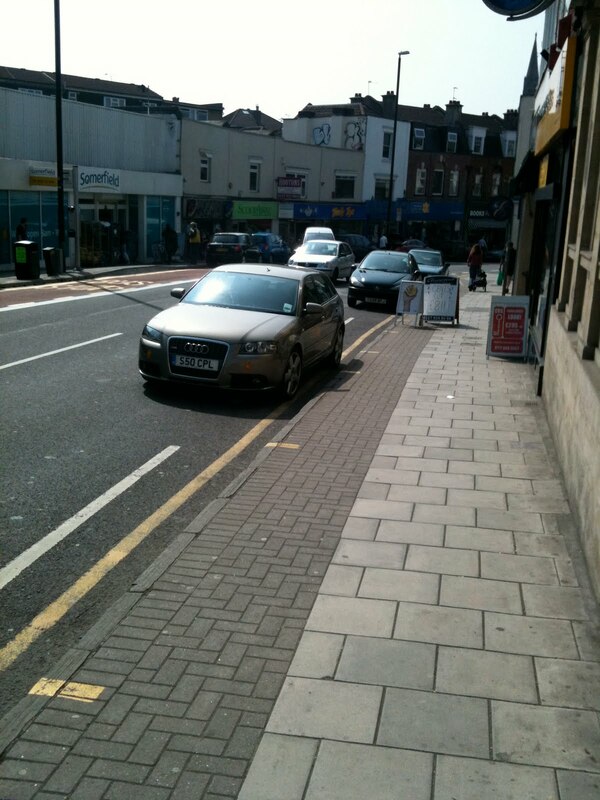 The AA learner car on Cromwell Road, just of Gloucester Road isn't parking in front of the no-parking-24-hours area because it needs to. That's the entrance to a block of student houses, which means people who need to learn to drive. In Bristol. Where knowing which keep clear signs you really need to pay attention to is important. 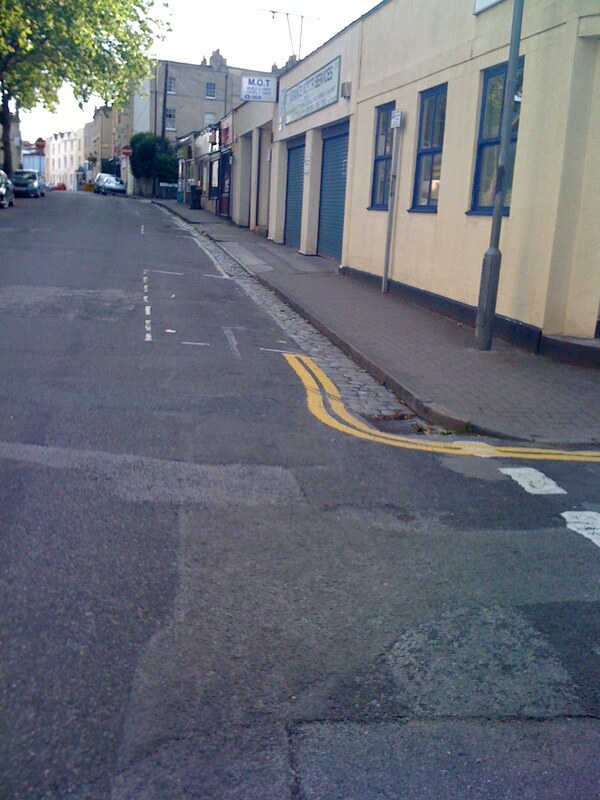 These signs are marked "keep clear" in white, but not double yellow lined, so not a concern of Bristol Parking Services unless/until someone needs to leave the facility, in which case it's an obstruction for which you get towed. Knowing the difference between the two is useful, though the tests aren't yet up to date with such subtleties. Bristol Traffic is a news channel. Maybe not quite the same as the MSM, like the Daily Mail or The Telegraph, but we like to think we compete with the quality dailies. And the Bristol Evening Post. So far we've co-existed well in Bristol, with BEP following our rabidly anti-cycling message almost every issue. There was a small shift in their editorial policy a few days ago, which we covered, but this was probably only a hiccup, although they did sponsor the Big Bike Ride. However, we're confident this was just an aberration, and we have photographic evidence. Down behind the Bearpit, in Broadmead, Bristol City Council are undertaking an experiment in The Horsefair and Penn Street, by only allowing through disabled badge holders, buses and taxis or emergency service vehicles. The experiment started on 11th December 2009 and was due to run for 18 months. It's still in place, so now seems permanent. It was interesting, therefore, to find Western Dail Press vehicle WU07XES parked up in a bus stop in The Horsefair, towing a trailer with an advert on it. It seems the driver needed a bit of refreshment - it's hard work driving around all day, pulling an advert. Well, it invited you to purchase the Evening Post so that you could "WIN THIS CAR". The editor here at Bristol Traffic was beside himself when he saw this, and immediately sacked the entire marketing team for not thinking of it first. But he's happy that the Evening Post are once again in the pro-motorist lobby. However, further up the same road that Tesco intend to inhabit, where it becomes Gloucester Road, the residents are far more subtle when it comes to Multinational Invasions. Here's the newly proposed Sainsburys site. Let's not question the need for another 'Local' or 'Express' or 'Metro' type supermarket here. After all, Gloucester Road is the last great British High Street, but why should we be concerned if Next or Primark or Currys or Superdrug move in and take over from the Bread Store, or T & Pa Murray, or even Totally Toys? No, north of Stokes Croft and Cheltenham Road they're all too middle-class for that. Have a close look. Not an anarchist in sight, but do you notice the squatters? Yes, that's right, T1GFM and P217GVB are blocking access to the proposed site without any need for trustafarians, police horses or road closures. Whilst Bristol Traffic generally endorses pavement parking, we don't feel we can take sides between Tescos and Sainsburys. Let's just hope it doesn't become another bicycle shop. Remember how only a few weeks ago we wanted to turn the back bike path to abbeywood into a proper road. There may be some good news there. First, note how the bike barriers are down. The fence to stop cyclists dodging the barriers now looks lonely, the path put in by people dodging the fence may even recover. The cyclists may be happy, but not all. Not Clive, whose email we picked up. I was amazed to see a car coming down the MOD Abbey Wood Cycle path (between the gated end of the lockleaze rugby grounds and the MOD gatehouse. The Driver, Mr Blair, was quite upset that cyclists were impeding his 'Right of Way'. Mr. Blair apparently lives in the house at the top of the path and claims that the route past the MOD has been 'his' right-of-way for 300 years . When I arrived at the scene, he was arguing with a student who he claimed was blocking his way. During his 'discourse', he caught a girl with his car door as she tried to get past. 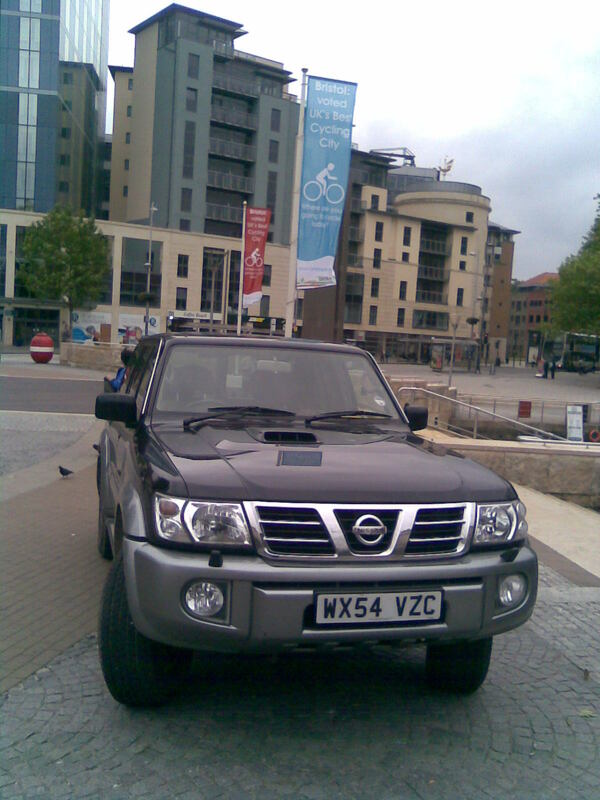 Now, he may indeed have some access right to his property via the cycle path ( I don't know, only S. Gloucester Cncl. can answer that) but does this mean he has vehicular access via this route? If he does, than S. Gloucester should signpost the track to warn cyclists and pedestrians that it is a shared thoroughfare, as most people will not expect to find cars on the path. How do I go about progressing this (from a safety perspective) to find out if Mr Blair is allowed to drive his car through this section of the cycle path, and if so, ensuring cyclists and pedestrians are aware of the danger. This is interesting. It's why we put the maps up last week. First, let's assume that the Mr Blair is the person by the rugby grounds who has an interested in old vehicles, many of which without tax or insurance. Driving them on private roads is the only thing he can do. The MoD roads on Abbey Wood are private, so if he has a historic right of way to get there then yes, he can drive down the bike path. That way he can drive his old cars without all the pesky government regulation, health and safety nonsense about seat belts and brakes working. Road tax, that stuff. One funny thing though, which the maps raise. Does the right of way extend to access to the MoD roads, or does it go to the woods and hence to the HP site, which has been fenced off since the mid 1980s? Is his claim for 300 years access is right, by our estimate this would put them within 50 years of end of the English civil war, some time before the Jacobite rising in Scotland, and therefore possibly predate Britain coming into existence. As ancient as nine-tree hill. If there really is car access on this path and to the MoD roads, then it shouldn't just be a luxury for one person. No, it should be something we can all enjoy: a new road between the A4174 Ring Road and Lockleaze, an alternative to the always congested, speed-camera enabled Filton Avenue. More investigations -and maybe some experiments- are needed. The poor owner of LG55URR is only parked across a dropped kerb near a school, so why on earth has he or she been given TWO tickets? We suspect this is probably just west-country persecution of Londoners in Bristol, which is not surprising - after all they're still getting Crossrail, whilst Bristol can't even get a decent bendy bus. Maybe they just get so chilled and mellow when they arrive here that they forget to drive. There's a lot of fuss about corner parking -how it's dangerous, how some bits of the highway code say you mustn't do it. What does it say? Not park within 50 feet of a corner? Ridiculous. That would never work, not in a modern city. No, sometimes you don't just have to park near the corner, you have to stop completely on it. Yes, it does force traffic to go round without much visibility, but, well, it's not as if you have any choice. Here we are in Easton/Lawrence Hill, at the end of St Gabriel's Road. The HGV is parked on the corner, but because it's articulated, it has managed to stay close to the kerb all the way along. Cars approaching from the north will see the vehicle and pass safely. From the south, well, it does appear to be hiding a bit under the trees. But see that paintwork on the road to the left? Slow. That warns vehicles approaching this junction that they should slow down, and so nobody should be surprised to see an HGV parked on a blind corner rather than on the empty road adjacent to the corner. Update: we forgot to thank RHP Transport HVG DX03XFF for their provisioning of a new traffic calming build-out in Easton. Thank you! Life is difficult for us motorists, and parking is a nightmare. Here's Lower Redland Road and the junction with Evans Road. It's Saturday afternoon, and there's just nowhere proper to park. As YF59YCW and others demonstrate. We are impressed. Our recent coverage of cycle lane sponsorship has highlighted a few local champions, so we'd like to extend a warm welcome to a new sponsor, City Property Lets, of Gloucester Road, Bristol. Here you see their special parking space, occupied on this occasion by an official CPL Audi S50CPL. It's only twenty to eleven in the morning on a Friday. Yes, news spreads fast, and only a few days later, a turf war erupts as Welsh intruder CU51FXL steals the space from the sponsor at three o'clock, again on a Friday. Now, we didn't see any smashed windows, or slashed tyres as a result of this incursion, but it's only a matter of time before this sort of rivalry spreads across Bristol's cycle lanes, which will lead to a summer of discontent throughout the city. It's tough being a builder. You get some random schedule made up by management, you are expected to keep to it. When you are on a project with unrealistic timescales, you need all the help you can get. This is where hire-it come in. Not only can you hire whatever equipment you need for your project, they deliver it before you are even on site. 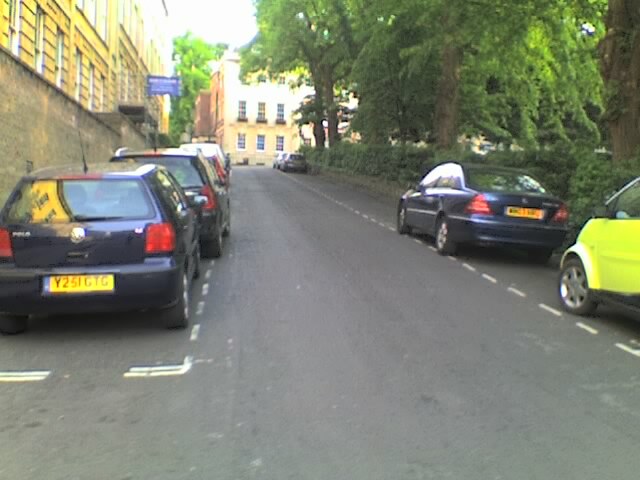 By parking on the double-yellow-lined bike-only-contraflow of Cotham Hill, the lorry S876CHT manages to completely block the contraflow and obscure visibility for any of those families, without slowing uphill motor traffic, who can easily swerve into the advisory bike lane on that side of the road. This will give the cycling families a harsh but honest reminder of how unforgivingly brutal the city streets are, and how anyone thinking they could get their kids to school safely on bicycles is living in some fantasy land which they need to grow up from and out of. As for the builders, they get their equipment delivered, before they even turn up. Here we are, twenty minutes later, and the building staff haven't even turned up, so they can be eating their morning bacon butties safe in the knowledge that whatever deadlines are going to be missed, Hire-It of Bristol won't be to blame. The best bit: they can be sure that their access to the building site won't be blocked by lorries -because it's already been and gone! Hire-It (Plant and Tools Ltd) are based in Weston Supermare; for anyone wishing to take advantage of this service their phone number is 01934 418591. We're a bit worried about the Evening Post this week, after they published an article criticising a white van for failing to stop after knocking a cyclist off their bike on the St Pauls roundabout. All we can say here is that it is fortunate that the E.P. commenting team managed to point out the obvious: that most cyclists are law-breaking criminals, therefore the statement by the cyclist is probably untrue, and even if it is, they deserved it. What nobody seems to have picked up on, here on the St Pauls roundabout itself, is a new sign that you can just see in the distant verge looking towards the Lawrence Hill roundabout: the speed limit on the dual carriageway has been dropped to 40 mph. This not only adds to our journey time, it will encourage more cyclists to try and use the road, to try and cycle across this junction -which it is clearly not safe to do! Lowering this speed limit on a busy motorway approach route will only encourage non motorised traffic, and so endanger them. What's even worse, when an article showing how Gary Hopkins, our new council cabinet member for transport had to park at a bus stop to nip into some shops, some of the commenters actually criticised Gary, even though most -rightfully- blamed passing cyclists. The fact is, if you drive round the city, the only short stay parking places are the ones where it is not technically legal: the double yellows, the bus stops, the school-keep-clear zones, the ambulance-only areas, the zebra crossings. Anyone who drives round the city, who tries to contribute to the local economy by nipping into shops or pubs on the way in or out knows that. Yet the E.P, rather than say Yes! We have a man on the inside! Finally someone who understands our problems! they criticise him, they say this is wrong, he should stop it. We just think we should say that. So we can say that we were first when the T-shirts using these slogans appear. Now, here is where it gets weird. After the denouncement of Gary went up, all the commenters started blaming cyclists or even joining in the denouncement -yet now those comments have gone. All of them. It's as if nobody ever said anything on the topic. They have been uncommented. All that is left is a couple of letters on the letters page, both of which blame Gary, rather than the failure of the city to provide short-stay parking by our cities newsagents, off-licenses and takeaway outlets. What has happened? Why are those people who dare to say the truth being censored by the E.P? I pay road-tax, so I expect my roads to be kept in good condition. No point in driving a brand new 4X4 and getting it ruined by ruts and potholes in town. So it's nice to see that Coldharbour Road, in Bristol, has now been resurfaced. Also nice to see the Council putting up helpful signs for me as I drive to the Cambridge Arms for my six pints of wife-beater. What I though particularly good was the way that road was kept clear at all times, with the pavements being used for the cones and signage. Perfect. The only minor downside was swerving to avoid the cyclists with bleeding noses in the middle of the carriageway as they avoided the well placed signs. Serves them right, they're usually on the pavement anyway. This is a before and after map series, full details of why to crop up later in the week. What is clear is this: No congestion on the ring road. No cycle lanes from the sports grounds to the ring road. Less traffic lights in the city. Not a coincidence. Now, map two, printed in 1997, in the time the socialists were in power, and things were bleak. The A4174 roundabout has moved to ST61607880, though not with the trees. South of it, the wasteland for motorbikers is now MoD abbey wood, with a moat on the NE side to eliminate the risk of anyone driving a truck full of explosives in, parking to the east and south-west and positioned to reduce the damage caused by anyone getting a car/truck full of explosives in there and blowing it up. Although the NI peace process was making progress, the tendency of the Provisional IRA to mark some kind of stalemate by blowing up prestigious targets on the mainland meant that these things were considered important. The disused station has been supplemented by the Abbey Wood railway station, which apparently has direct connections with Wales. The former Filton Junction station, north of the A4174, is now marked as Sta (dis) to indicate its new state. South of the MoD facility, just north of where the Tailspin housing estate is still being built, a bike path. And what else has changed? Congestion. Is it any coincidence that there are traffic jams on the A4174 now that a bike path connects Lockleaze with the ring road, and that the new roundabout and the one by the M32 have traffic lights? We think not. The final item of this note is the rights of way, the footpaths. These two maps imply that there was never any right to cycle through the rugby grounds, even the footpath doesn't go direct from Bonnington walk, but instead via Landseer Avenue. And here's the best bit: the right of way finishes by going through the MoD moat, through some of the building, and out the other side. We think pedestrians wanting to walk from Lockleaze to Sainsbury's should be made to walk this route, as it will reduce the number of them pressing the cross button on the pelican lights at the ring road. In East Germany, people feared the Stasi: Europe's best secret police, where about one adult in six was reporting on the others. Nowadays, people think the future lies in instrumented cars, datacentres and the like. We say no, back to the old ways! All it takes is for people to get out there and report on each other! If you don't see anyone else, report yourself! Showing that people beat technology, some (sadly low quality) footage hits our inbox of the ubiquitous YA55VDY van, here in Montpelier. This is the first time the driver has ever made the screen, normally because they manage to get their dairy delivery van close enough to the destination that they can slide back the door and unload. But here, in Montpelier, they are forced to get out and walk across the road. They are at least wearing a hi-viz top, as crossing roads is dangerous. We would rather swerve across the road and park on the pavement than do it ourselves. The fact that the van has now been forced to park on the wrong side of the road, increasing danger to the driver and slowing their delivery schedule down shows how Montpelier's anti-car policy is increasing business costs in the city, just as Noel Edmonds complains. If the pedestrian people hadn't had the bollard put back in at the turning, and added that bike parking outside the Thali Cafe, there would be more parking for important deliveries -and the driver would not be forced to risk their life by crossing this busy road -where they could easily be hit by passing bicycles. We are pleased to announce another week's sponsorship of the St Werburgh's tunnel by SITA refuse collection, a fact celebrated by the brand-awareness siting of the truck WX51HBF at the end of the lane. Some people might think oh-no, they have just photoed some refuse collectors who have parked out the way of passing cars for a quick break and perhaps a cigarette or two. We say no! Look: this is the day before the bees-and-bicycles parade at the St Werburgh's farm fair. 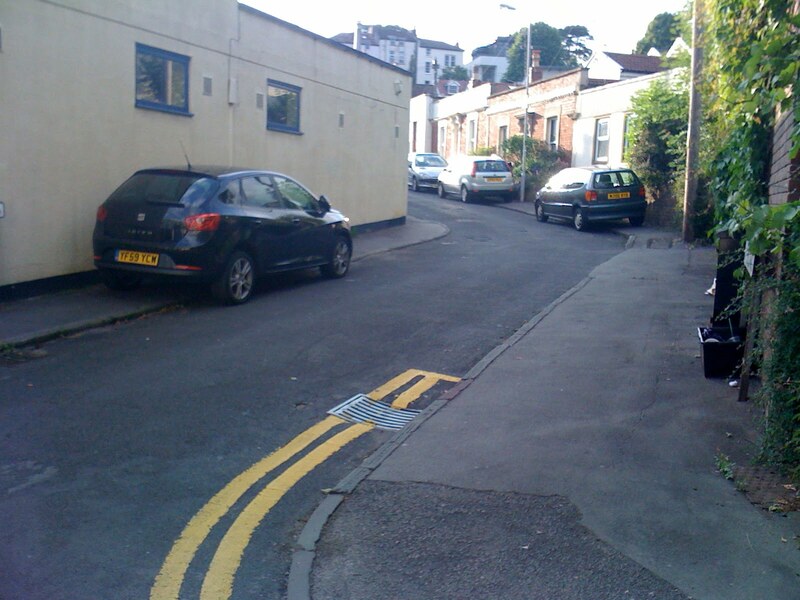 In the background of the picture you can see a Bristol Parking Services van, as an official member of the Bristol Parking Services team places no parking cones along the road. As he does not place one adjacent to this van, or request them to move, the van is clearly here with approval from the council. Therefore, it is an official sponsorship deal -possibly even related to the farm fair! Couple of months back, paul@loop-pr.co.uk commented on a posting, offering a traffic-related news story. Obviously we never followed up anything which would involve effort, though we did see that the company is a media relations company which specialises in taking your brands and making them newsworthy. Obviously, we are ourselves a world famous brand, so don't need to waste money in coverage ourselves, but one of the company's customers is streetcars, the second car-by-the-hour scheme in the city. For some reason Paul didn't ever follow up with a news item, which is a pity, as we are not above receipt bribery. But still we waited. Today, though, in a bribery-free article, we are show why you should spend the money. Here we can see the streetcars car YK10LHD making the poor pedestrians of deprived inner-city Clifton feel even less worthy, as now they have to detour around a car in the middle of the pavement. Same for this cyclist, who cannot ride straight up to the bike park, they must instead dismount and walk. Here though, you can see why streetcar are parked in the middle of the road, taking up all walking space. As well as the underpeople we've seen, there are lots of students in the area, and for about £7/hour they can rent a series 1 BMW, which you can then use to park on pavements! What a fantastic idea! Students: for only £7, instead of walking, cycling, or worse -use public transport- you can have a real car, and experience being an adult. If there is one flaw here, it's timing. Year end. That means no money. Wait until October, when the loans have just arrived, the credit cards haven't topped out. That's the time to sell the dream. Clearly some students, rather than being driven to school, are cycling to the bottom entrance and then walking in. It is important to stop these students from parking their bicycles on the road, as it will upset residents who will find it harder to walk to their cars. One of our reporters "P", sends in a couple of pics of Berkeley Square, off Park Street. The first notes the availability of a large area of parking spaces. 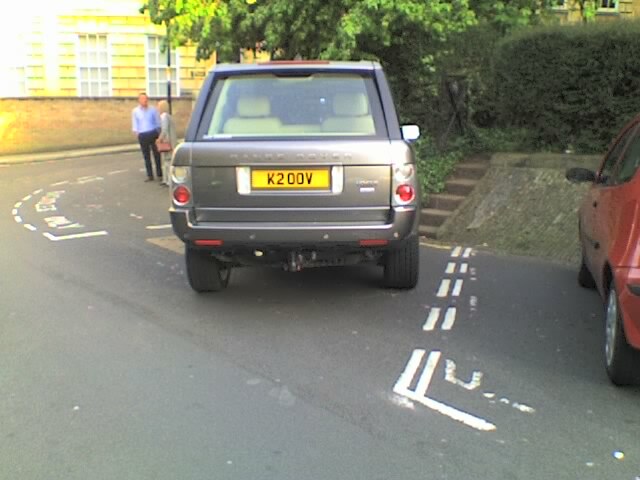 Yet round the corner, the range rover K200V is parked in front of the steps, on the yellow lines. Our reporter asks us to explain the reasoning here. Well, its obvious why anyone who owns a range rover would park where it has. It's drive in, reverse out, saves with the trickiness of a parallel park in such a vehicle. It's probably cheaper. If you park in a paid area you are expected to have a ticket, whereas in the single yellow lined area, it is free except if a traffic warden is to catch you out. If the penalty is £30, if the cost of being ticketed is less than one in 30, it's cheaper than paying a pound to park for a while. The paid parking area may be time limited, the penalty for parking their past the limit the same as on the yellow line -so why not park closest to your destination. Most importantly, the steps from the park actually provide a safe and convenient access point to the vehicle. Without them, getting in and our your Range Rover can be quite tricky. Some people my think that the RR is blocking pedestrian access to and from the park. Not so. It is possible to get in and out, you simply cannot run down the stairs and straight into passing traffic. In the absence of any tax-payer funded pedestrian safety features, the range rover driver is providing such safety features as a charitable gift to people too poor to afford their own 4X4. I've been concerned about the way that the council have been using my taxes to produce cycling propaganda, with flags and banners up around the Harbourside. I am glad that the driver of WX54VZC has taken it into their hands to provide a counter-demonstration. While cyclists are lobbying and agitating for more secure cycle parking, it is clear that you can just leave a 4x4 anywhere, without worrying about whether it will be there when you come back. Concerned of Cliftonwood was kind enough to point out the Porsche parking zone outside Waitrose, but what if you don't have a Porsche and can't afford to shop at Waitrose? As VW Polo Y165JBM demonstrates, there's plenty of parking space on the other side of the road. Never mind the bollards. Who cares about the bike lane? Great access for Sainsburys. Look and learn, kids. 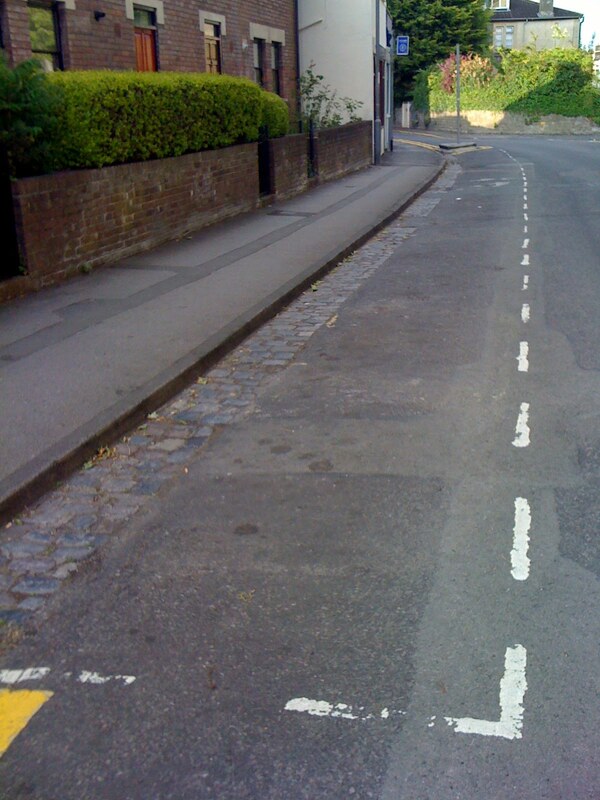 Recent news about sponsorship of London's Cycle "superhighways" make us wonder how we could arrange for some bike lane sponsorship -ideally some plan that actually benefits us, the motorists. We are pleased that our plan has come together. We are offering a community bike lane sponsorship deal, where any motorist, company, school or retail outlet is free to sponsor a bike lane. In exchange for this they not only get credit for their environmentally friendliness, and the ability to count any increase in cyclists as a CO2 offset against any other CO2 releases, they are allowed to park in the specific bike lane. Above, on stokes croft, the bike lane is sponsored by the post office and and the car S345BPP. Elsewhere, in St Werburgh's, the tunnel bike lane is sponsored by Sita -the council's refuse collecting contractors, and the van WX51HBF. Contribute something back to the city by sponsoring a bike lane today! 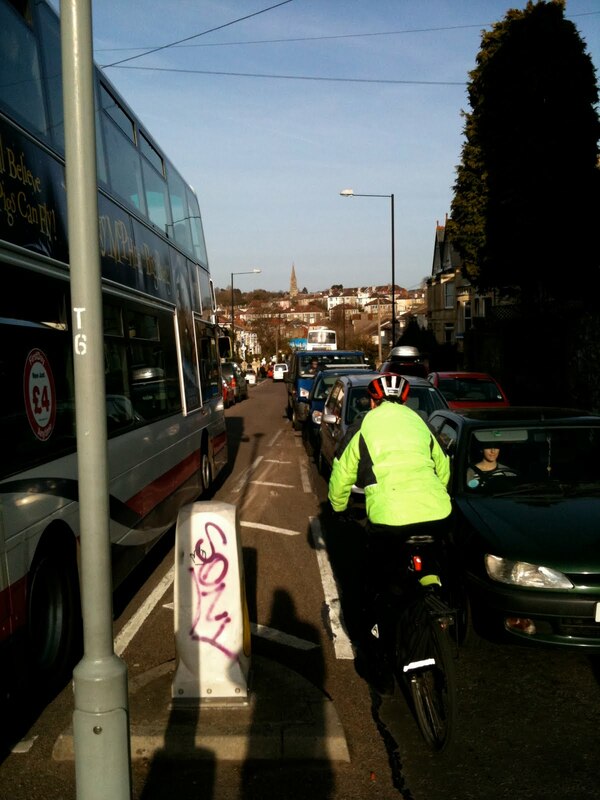 The credit for "gold" sponsors include a special mention on Bristol Traffic! In our coverage of the two-wheeled enemies of proper transport options, we have neglected their fellow-traveller, the unicycle. They come out, they spin their wheel, they take up space, they pay no road tax. They don't even have brakes! They even use the same route options stolen by bicycles and pedestrians from us. This particular one, Peter Haworth, is apparently in training for cycling the Coast to Coast ride this coming August, according to his web page. We strongly encourage people to sponsor Peter, as it will ensure that for one week -and probably the week after-, there will one less unicycle in our journeys through Montpelier. As UK taxpayers can get basic rate tax back on their donation, we can also be happy that a fraction of our donation will not be frittered away on cycle paths or trains.